The Texas Charter Schools Association (TCSA) named Dr. Soner Tarim the Leader of the Year and Ms. Brooke Lucero the Teacher of the Year at the 2017 Texas Charter Schools Conference last week. TCSA’s Chris Busse presented the awards to Dr. Tarim and Ms. Lucero at a luncheon with Education Commissioner Mike Morath, and discussed their contributions benefitting students and the charter school sector in Texas. This award honors one outstanding charter leader from across the State of Texas. As the second recipient of the award for Leader of the Year, Dr. Soner Tarim received a complimentary registration to the conference, a plaque, and a cash award of $1000. The award recognizes charter leaders that advocate for charters at the state and national level, have successfully replicated high performing charters that are innovative in their approaches to educating all students, and serve as a mentor to other charter leaders. Dr. Soner Tarim is the Founder and CEO of Harmony Public Schools and he has been an educational advocate for more than 30 years, encouraging students in underserved communities to pursue learning in science, technology, engineering, and mathematics (STEM) fields. He is a driving force for STEM education throughout Texas and the United States. He brings decades of experience developing innovative educational programs for K-12 schools to Harmony, which has garnered state and national recognition for its high academic standards. Harmony was a finalist for the Broad Prize for Urban Education in 2017. The Broad Prize for Urban Education recognizes school districts in urban areas for closing the achievement gap by improving academic performance of low-income and minority students. 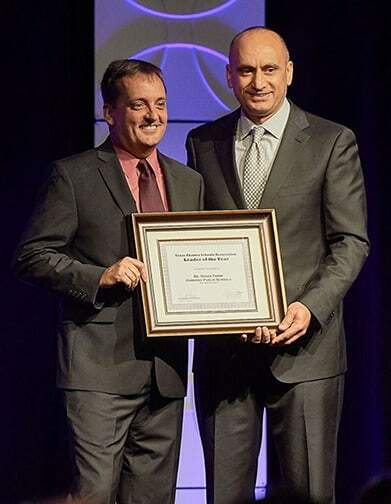 Under Dr. Soner Tarim’s headship, Harmony has earned the reputation as one of the best charter schools in the country, many of its campuses recognized on prestigious high school rankings, such as News & World Report and Children @ Risk. These successes have only increased Harmony’s demand with 55 campuses scheduled to open in the 2017-18 school year in Texas and Washington D.C., educating close to 36,000 students. Dr. Tarim holds a Ph.D. from Texas A&M University and is a trained biologist and ecologist. He taught courses in biology, ecology, general science, and physical education at the high school, college and graduate-school levels, and spearheaded scientific symposiums and international science Olympiads, such as the International Sustainable World Energy, Engineering, and Environment Project – or ISWEEEP — which attracts more than 600 top-ranking high school students from more than 60 nations. Dr. Tarim continuously works toward building meaningful partnerships, maintaining effective communications and positive relationships with high-level corporate and civic leaders to advance high-quality, rigorous education throughout the state and nation. This is the second year for TCSA’s Teacher of the Year program which honors one outstanding educator from across the State of Texas. As the recipient of the award for Teacher of the Year, Ms. Brooke Lucero received a complimentary registration to the conference, a plaque, and a cash award of $1000. 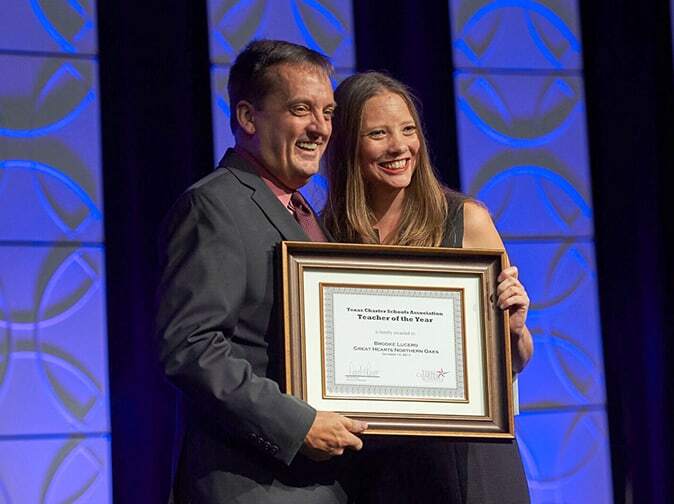 The award recognizes charter educators that advocate for charters at the local level, are innovative in their approaches to educating all students, and serve as a leader on their campus and within their communities. Brooke Lucero is a special education teacher at the Great Hearts Northern Oaks campus, and has 10 years of classroom experience. She inspires students of all backgrounds and abilities to learn. Ms. Lucero uses Socratic Seminar, knowledge of different learning styles, strategies, accommodations and modifications, knowledge of behavior analysis as well as multiple positive behavior supports and systems to work with the special education students she teaches. Great Hearts is passionately committed to cultivating the hearts and minds of students through the pursuit of truth, goodness, and beauty.